We've been excited to build Avalon Select in order to introduce a number of wonderful products to the world. And we've loved serving customers since 2014. Today, though, were announcing a change. Due to shifting business models with our product and shipping partners, we are no longer directly selling and shipping products. Instead, we will include links to resources where you can buy the products we talk about. We hope this provides you with an easy option for still getting some of our favorite stuff! If you're a customer, you can still contact us about any past orders and we'll be glad to help you out. Thank you! We speak frequently about the benefits of ozone, especially in regards to doing laundry with ozone. (At "authorized prices," we're able to make sure you get a warranty with that product. Some people prefer spending less on Amazon and not getting warranty coverage.) But we're also big fans of ozone's potential in the world of health. This is because ozone is O3, or 3 atoms of oxygen, and it quickly breaks down into O2, or the oxygen molecule that we breathe. So it's able to flood the body with oxygen, which can have anti-inflammatory effects, kill pathogens (viruses, bacteria, fungi), boost energy, and even stimulate some tissue regeneration. We should point out ... a water ozonator is not a health device. It can produce ozonated water for a variety of uses like cleaning food and cleaning the home. It's just that some people choose to use it for drinking water too. We always recommend you research this topic before doing so and determine if it's right for you. 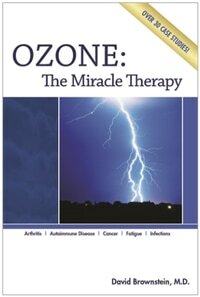 In any case, medical doctors who choose to use ozone therapy don't have you simply drink ozonated water. They actually inject the ozone. And while we've heard that this is more common in Europe, there are some non-conventional US-based MDs like Dr. David Brownstein who provides this service, and his new book, Ozone: The Miracle Therapy, talks about the many benefits. Follow that link to see x-rays of a patients joint repair that was entirely the result of injected ozone. Surgery avoided. Sorry, but one more link over to Amazon in case you want to see Dr. Brownstein's other books. The one he promotes most often is the one on iodine, and we agree that this is one topic that's not understood widely enough. But the new ozone book can only be found at this time on Dr. Brownstein's site. Does Cacao Give You Energy? If you read about health at all, you probably know that new studies come out practically every week touting the health benefits of cacao -- the basis for chocolate. While some writers talk about the potential hazards of raw cacao, most researchers are finding benefits for the heart, blood pressure, skin, brain, and more. So amidst its benefits, does cacao give you energy? Some people think it has caffeine in it; others think it has NO caffeine, but something in the same family called theobromine, which is said to have a gentler lift to it. Either way, it is believed that cacao gives you energy. How much energy depends on how much you consume and of course your individual physiology. 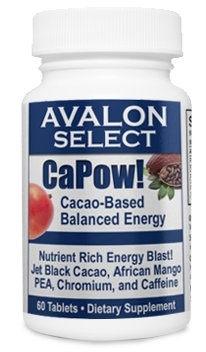 But if you want the benefits of cacao and you want to make sure you get an energy kick, we'd love to recommend our cacao supplement, "CaPow!" This product isn't delicious like chocolate (it comes as a tablet that you simply swallow), but a serving is also a whole lot cheaper than buying chocolate (especially raw chocolate), and it doesn't have the sugar or the fat that you get with chocolate. One tablet of CaPow! not only provides you with 150 mg of pure cacao; it also provides 150 mg of African mango extract; 90 mg of PEA (the happy chemical); and 240 mcg of chromium. These are all designed to help support weight management. Finally, it includes 100 mg of caffeine -- about the same as a cup of coffee. All combined, we've found this to be the perfect amount of lift without causing jitters. (It's been great when starting to feel sleep at work or at the wheel!) And once in a while, we find that the ingredients hit just right and cause a bit of a euphoric feeling as well -- perhaps the impact of the PEA. Interested in an energy boost with the benefits of cacao? Interested in avoiding sugar and fat? Give CaPow! a try. Many of us interested in natural wellness are already well familiar with the idea that natural fats are healthy and actually essential for one's health, even though the mainstream message for several decades has been to avoid fat as something that leads to heart disease. Meanwhile, those in natural wellness have pointed repeatedly to the dangers of added sugar (which is finally going to become a line item on food labels), with well over 100 health problems related to sugar. And recently, it became mainstream news that the sugar industry skewed studies from the 1960s about its role in heart disease, trying to put the blame on fat. Well, all things in moderation. We believe the right fats should be consumed (and certainly not artificial fats like hydrogenated oils) in the right amounts, so it's not about indulgence. And avoiding sugar by consuming artificial sweeteners may be an even worse choice than consuming sugar. The more we get honest science about this type of thing, the more we can have educated conversations and make educated decisions as consumers. The dangers of added sugar are exactly why we encourage people to look at alternatives to dessert. Anything from reducing portions to finding healthier options. And it's why we like the trend of healthy chocolates that do not include dairy or refined sugar; often have other superfoods added; and in some cases they choose low-glycemic sweeteners like xylitol. This means they have little to no effect on blood sugar levels while still providing a sweet experience. This is why we carry Tru Chocolate (organic, no dairy, no sugar, gluten free, and loaded with superfood ingredients). It's not your only choice for healthy chocolate, but if it is your choice, we offer excellent pricing in bulk so you can have your sweet fix at the best possible price. We came across a recently updated article on essential oils that promote hair growth and thickness. We're usually happy to link to outside articles, but in this case the heavy advertising creates such a slow and bad experience, we'll show you the link here (for reference); you can choose to copy and paste if you so choose. You've been warned. The two that fall into the traditional category of essential oils are lavender oil, which is possibly the most flexible and the most widely of all essential oils. They point out that it promotes hair growth and improves the "overall quality of the strands." They also point to peppermint essential oil, which can stimulate the hair and scalp. They recommend massaging it into the scalp at least once a week. We like the idea (and personally find that a couple drops of peppermint oil rubbed directly onto the belly is tremendous in addressing stomach aches), but caution you to use a carrier oil, as peppermint oil is very powerful and may provide a burning sensation. Always patch test any oil you want to use on your skin. We're big fans of essential oils, as we are any natural products that carry so many benefits. And with essential oils, you get the benefit of amazing smells. In fact, these smells are a big part of the power, and as with all our essential oils inhalers, these oils can be used strictly on a scent basis to provide a positive impact as shown by the science of olfaction (smell) and how smells trigger different responses in the brain. An article posted earlier this month confirms much of what we've pointed out on this site about using an ozone laundry system. While the article talks about a commercial system for large laundry operations, it points out that ozone kills bacteria far more quickly than bleach; that laundry comes out fresh; and that there are real cost savings along with a reduction in chemical usage. The latter is something we personally love about our home ozone laundry system. We love that it will pay for itself in a year or two through cost savings, but we love even more that we're not wearing clothes and sleeping on sheets with residual laundry detergent every day. We're so swamped with chemicals in our world already, no wonder so many people struggle with allergies and skin problems. Besides, not having to figure out whether to run hot or warm or cold laundry loads (you never pay to heat your water with ozone) and never figuring out how much detergent to add ... these just make it easy to do laundry. And each to his own, but we prefer not having to put much energy into something like laundry! We're experimenting and hope you love the results. We're trying our hands at free shipping. On everything. Well, in the continental US anyway. We used to charge a flat rate for orders below $49 and, speaking plainly, maybe we'll find that we need to do that again. But for now, we're giving this a go, making it easy for you to explore our products without worrying about reaching a certain purchase level. Yes, even order something small like our essential oil inhalers and pay nothing for shipping. Man, these things are awesome, because you always have the power and pleasantness of essential oils as close as your pocket. And while they officially claim that smells will last for 60-90 days ... ours still smell great after a year! So what are you going to explore here now that shipping costs aren't holding you back? Today we ran across another company excited about the chocolate energy product it was selling. It's literally a piece of chocolate that includes some caffeine and some B and D vitamins, so we guess it probably tastes nice. But that's not all it has. There's sugar, corn syrup, and d-mannitol as a sweetener. And this is from a store that carries tons of healthy products, so if you didn't read the label you might think this was a good way to get your vibe on! At just $7, it's a pretty great deal ... until you realize it's $1 per serving. (Yes, just 7 servings.) And for yet another unhealthy energy product. If you don't mind, we'd like to suggest CaPow! as an alternative. This is not a chocolate candy (it's a tablet you swallow), but it's still made from cacao (the basis of chocolate). So it packs in the nutrients of real cacao without the problems of sugar, milk, or other chocolate ingredients. It also teams cacao up with African mango extra, PEA (the feel good ingredient), and chromium, along with the caffeine of about one cup of coffee. These ingredients balanced together promote an emotional lift and an even feel of energy rather than the jitters of straight coffee. Some of the ingredients promote weight management as well, though we would see that as a side benefit. The core of this product is feeling great and feeling full of energy. And all at about 33 cents per serving. So if you need to include a bite of chocolate with your energy boost, you could still couple this with some healthy, organic chocolate and pay less than you would for that other company's product. Want a healthy chocolate without the sugar? You can also look at Tru Chocolate and Tru Chocolate snacks. This is more expensive than your average chocolate, but it will still give you a bite of chocolate and a serving of CaPow! for under a buck. It seems like almost every day there's another article posted on the health benefits of eating dark chocolate. And new studies on eating chocolate seem to appear almost as often. At least it feels that way. There are an awful lot of studies on chocolate! So today a couple of articles caught our eye as we were thinking about the chocolate we carry -- Tru Chocolate. One of these talks about "8 Everyday Health Problems You Can Cure with Chocolate." Apparently the writer doesn't know that the word "cure" is reserved for pharmaceutical drugs, and that you're not supposed to claim that natural products can "cure" anything. We'll let that be their challenge for now. We'll just report on what their article talks about. In regards to libido, they say that chocolate is "abundant with a chemical called phenylethylamine which stimulates your senses and promotes a mood of excitement and well-being." They also rightly point out that, for best results you should stick "to more pure sources of cacao, such as unprocessed cocoa powder or organic dark chocolate." The other article is about 3 foods that help you to lose weight: grapefruit, lettuce, and dark chocolate. (Which do you think is our favorite?) Now we've always pointed out that, for health benefits, you should eat dark chocolate in moderation -- an ounce a day or less. And Tru Chocolate comes in 8 gram pieces, so you should be able to safely eat 3-4 pieces a day. The article agrees with moderation, pointing out that healthy dark chocolate can curb your desire for other, unhealthy sweets. It also says that it can help to slow the digestive process (so you feel full longer), and that "dark chocolate ... has healthy fats that can help keep metabolism up." Many articles on dark chocolate will point out that the value of dark chocolate is higher than that of "candy" chocolate because of the high levels of sugar in candy. But no one really talks about sugar-free chocolate, maybe because there aren't many healthy options for sugar-free chocolate. Most use artificial sweeteners. From what we've seen, Tru Chocolate has one of the few truly great ingredient combinations with a natural sweetener that's low on glycemic impact and tastes great. Looking to promote your health while enjoying the heck out of the process? We hope you'll give Tru Chocolate a try! In our effort to share healthy, green, and progressive products with our customers and visitors, we've partnered with Plantessence to bring you their exclusive line of essential oils. Many essential oil companies make nice smelling oils that may or may not be therapeutic. Others make therapeutic oils by correctly processing the oils, and by doing so from the right plants and the right parts of the plants. But as far as we know, only Plantessence tests their oils with Heart Quest, which assesses heart rate variability. While this is not a mainstream medical test, it is an exciting new technology based on the understanding that the heart does not just go "bump bump," but beats in complex patterns as part of the body's overall communication system. We'll talk more about this when we develop a lead product page for all of the Plantessence oils we carry, but you can learn about Heart Quest here, and then understand why we're excited to offer you oils that have been shown to have excellent results according to the Heart Quest system. Again, we're still working on a page that details the oils, but you can find the oils in our store by clicking here. You'll find that we don't just carry bottled oils, but also inhalers, which let you more easily carry the power of essential oils with you. Just inhale a few times deeply and the oil essences can activate responses in the brain.